These two tireless spokesmen and workers against the oppression of children for monetary gain, and the rights of girls to an education have been awarded this honor and award. It is ironic that Pakistan and India were shooting at each other just last week in Kashmir, for the first time since the 2003 treaty. Both of these countries, suspicious neighbors at best and open haters are the least have nuclear weapons in their arsenals. Hopefully, Yousafzai and Malala will be able to educated the world in these problems of exploiting children for monetary gains in India, and inequalities of education in Pakistan. Together in their gentle and peaceful ways, leading the world to greater understanding and peace. Kailash Satyarthi is the first Indian to win this coveted prize. He has tirelessly worked for children’s rights following Mahatma Gandhi’s peaceful example. Malala Yousafzai through her life and courage has very poignantly demonstrated the value of young women as leaders in the world, worthy and well equipped for education. (CNN) — The Nobel Peace Prize was awarded Friday to India’s Kailash Satyarthi and Pakistan’s Malala Yousafzai for their struggles against the suppression of children and for young people’s rights, including the right to education. Yousafzai came to global attention after she was shot in the head by the Taliban — two years ago Thursday — for her efforts to promote education for girls in Pakistan. Since then, after recovering from surgery, she has taken her campaign to the world stage, notably with a speech last year at the United Nations. Through her heroic struggle, she has become a leading spokeswoman for girls’ rights to education, said Jagland. According to the Nobel committee, at 17 she’s the youngest ever peace prize winner. The Malala Fund, set up to promote girls’ education, saidvia Twitter that Yousafzai would give her first statement after classes end Friday. She attends a school in Birmingham, England. Meanwhile, Satyarthi, age 60, has shown great personal courage in heading peaceful demonstrations focusing on the grave exploitation of children for financial gain, the committee said. Satyarthi told reporters that the award was about many more people than him — and that credit should go to all those “sacrificing their time and their lives for the cause of child rights” and fighting child slavery. “It is a great honor for all those children who are deprived of their childhood globally,” he said. Pakistani Prime Minister Nawaz Sharif congratulated Yousafzai in a statement issued by his office. “She is (the) pride of Pakistan, she has made her countrymen proud,” he is quoted as saying. “Her achievement is unparalleled and unequaled. The Nobel committee said it “regards it as an important point for a Hindu and a Muslim, an Indian and a Pakistani, to join in a common struggle for education and against extremism. U.N. Secretary-General Ban Ki-moon congratulated both winners, describing Yousafzai as “a brave and gentle advocate of peace who through the simple act of going to school became a global teacher” and Satyarthi as having carried out heroic work to combat child exploitation. “The true winners today are the world’s children,” he added. Nigel Chapman, chief executive of the Plan International aid organization, said the award brought a “fantastic glow” to his heart. “I think anybody who’s interested in campaigning for children’s rights is absolutely thrilled by this news,” he said, speaking to CNN from New York. Chapman praised the Nobel committee for its smart move in awarding the prize jointly to Yousafzai and Satyarthi, who are “two major heroes” in their countries. There are still 65 million girls worldwide who are not in school, he said. Millions start lessons but drop out for reasons including having to work or being forced to marry very young. He said it was also a great boost for campaigners on the eve of theInternational Day of the Girl. They “deserve the Nobel Peace Prize for their courage, determination and for their vision that no child should ever be left behind and that every child should have the best of chances,” he said. European Union leaders Jose Manuel Barroso and Herman Van Rompuy said the prize was a victory for all the children around the world who aspire to go to school. “Today’s decision pays tribute to the undisputable right to education for all children, equal rights for women and the important campaign against their oppression,” they said in a joint statement. When the European Union won the peace prize in 2012, they said, it decided to use the money for the same purpose, through an EU program for children in conflict zones. He said he hoped it would bolster the political will of countries and institutions worldwide to uphold the rights of children. Salil Shetty, secretary general of Amnesty International, hailed the pair’s work as representing the struggle of millions of children around the world. “This is an award for human rights defenders who are willing to dedicate themselves entirely to promoting education and the rights of the world’s most vulnerable children,” he said. The Norwegian Nobel Committee makes the point that 60% of the current population is under 25 years of age in the poorest countries of the world. 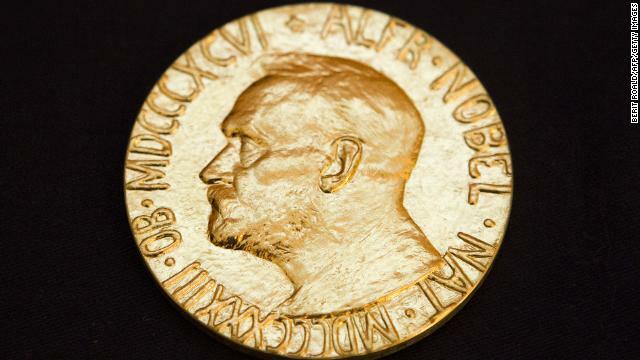 The Norwegian Nobel Committee received a record 278 nominations for the 2014 prize, 47 of which were for organizations. Each prize carries with it a monetary reward of 8 million Swedish kronor (about $1.1 million) to be divided among the winners. CNN’s Lindsay Isaac, Alexander Felton, Sophia Saifi and Radina Gigova contributed to this report. What do you think of these choices? This entry was posted in awards, India, Uncategorized and tagged 2014 Nobel Peace Prize, courage, Ghandi, Hindu, India, Kailash Satyarthi, Malala Yousafzai, Muslim, Pakistan, peaceful demonstration, rights of children, rights of education for girls. Bookmark the permalink. Ian. . . . Sometimes I do it right and then other times it is just the link. . . Sigh. . . . Thanks ! LOL. . . . I do have faith , my friend, but not much in moi! Thanks, I think I understand . . . we shall see. Stay tuned! Here is a short link to a video tell if it comes out ? Indeed it did, and I watched it for the first time. I am not a Michael Jackson fan and so I missed a great song and video. . . silly me. I liked the emphasis on the whole of creation and not just animals or people or the earth. . . Only complaint was the length . . . . long, I thought. . . I know you asked me only one simple question and not all that. . . .just wanted you to know I haven’t forgotten the question! It is a great video Anne and he really was an amazing singer/songwriter. It really stirs the heart watching it! I also tried without success to upload a screenshot but still learning – need more practice! Added link and will try opening in browser and then you can save the image. More soon ………. practice – practice – Moi! Know what you mean but he was in the media’s public eye – does strange things all that ego!! Yes, indeed. It was a brilliant move by the committee to see this and follow through! Thanks for the comment, my friend! Hope this works never done this with screenshot before – just learning – let me know? I couldn’t get it open. . . This didn’t open when I clicked it either. . . darn. . . .